A previously untold story of three African-American women working at NASA, who served as the mathematical brains for the early US space missions during the Cold War and continuing racial segregation. To include news from the Bath Film Festival. This delightful Japanese film revolves around 3 sisters who discover - at their father's funeral - that they have another, younger sister from a relationship their father had later in life. It simply and beautifully follows the absorption of the new sister into the fold, which in turn allows the evolution of the new family unit, and its transition into maturity. A ftting tribute to mother and daughter Debbie Reynolds and Carrie Fisher who died on consecutive days in December 2016. The strong bond between the late actors is brought to life in this heartfelt and funny documentary that offers many poignant moments. 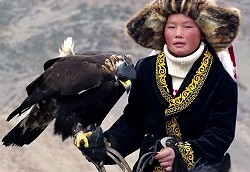 This stunning documentary follows 13 year old Aisholpan in her quest to become the first female eagle huntress in twelve generations of her nomadic Mongolian family. Faced with the prejudices of the elders, she forges ahead with her dream supported by the loving training of her father. Plus reel people's 20th season celebrations. A great performance from Annette Bening as a determined single mother in her mid-50s, raising her adolescent son. She decides to enlist the help of two younger women providing a poignant and amusing love letter to the people who raise us and the times that form us. Great soundtrack and reminder of a time not so long ago. 1940s Britain and Catrina Cole (Gemma Arterton) is employed to write scripts for government propaganda films. The team includes Bill Nighy in yet another wonderful role as pompous, ageing film star Ambrose Hilliard and there are a number of familiar faces in various cameo roles. This is a soulful film that has two stars: the feisty Spanish actress Anna Castillo (Alma) and a vast, gnarled two-thousand year old olive tree that her father sold to support their farm. Her quest is to recover the tree from its new home in Germany. In deepest rural France a GP who has cared for people all his life has to take on a young assistant as he himself has cancer. The slowly developing partnership provides the low key genre that the French do so well. Six months after the devastating floods on the Somerset levels and the death of her younger brother, Clover Catto returns to the farm and her father who she hasn't spoken to in years. Clover is sent on a voyage of discovery of her family, her upbringing and herself. 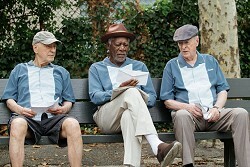 When three ageing friends suddenly find themselves facing a future of financial difficulty, they decide to take drastic action. How will they manage it? A fine caper to bring to a close reel people's 20th season.